One of few surviving “radio towers” that were built before and during World War II has been gaining local attention in Nagoya, prompting residents to push for the important legacy to be preserved. The radio tower in Shiga Park in Kita Ward is one of 460 that were built in parks and other locations throughout Japan to broadcast radio from built-in speakers and spread information swiftly. But more than half of the towers have been taken down and very few people are even aware they exist. 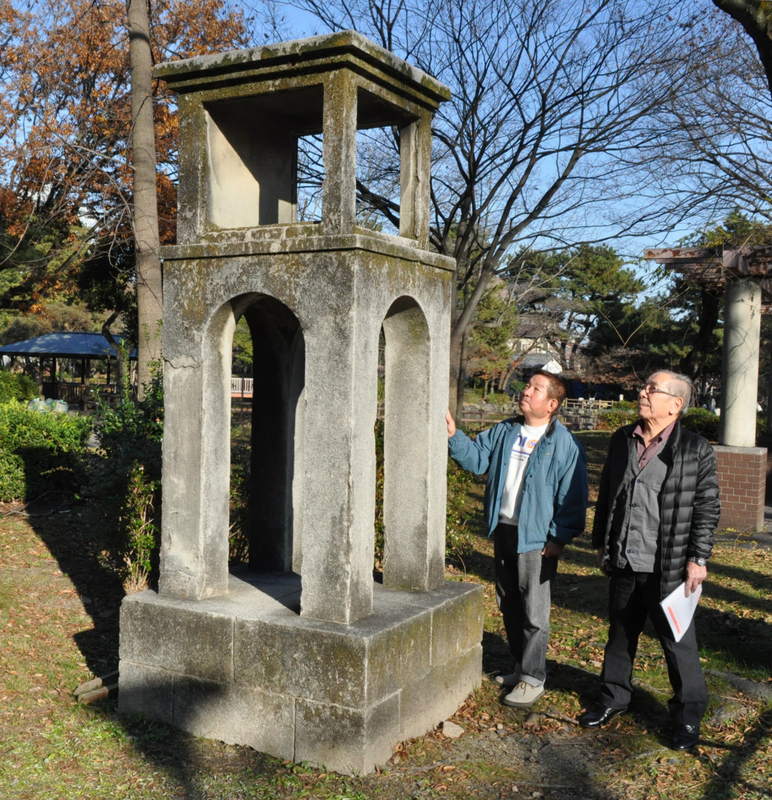 The 3-meter tall concrete tower in Shiga Park was built in 1942, according to an identification plate. Masahiko Yoshii, 71, a former visiting professor at the National Museum of Ethnology, said radio broadcasts emanated from the speaker in the tower’s upper window. Residents used the device to exercise or listen to live broadcasts of sports events, according to Yoshii. 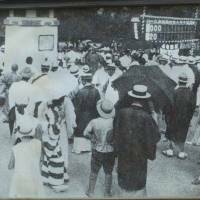 Shinichi Hotta, a curator for NHK Museum of Broadcasting, said the Tokyo-based broadcaster, in cooperation with local governments, set up radio towers in parks and temples across the country from 1930 until the middle of World War II as a partial response to the 1923 Great Kanto Earthquake. Many towers are shaped like a toro (garden lantern), but there are some in the shape of bonbori (paper lantern) with receivers inside the tower. 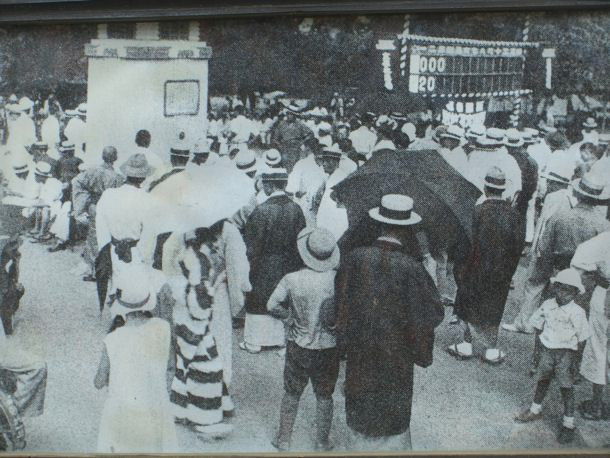 “During World War II, it was used for press control and to increase the people’s fighting spirit,” said Yoshii. Many of the radio towers were dismantled so their metal components could be used for the war effort, and need for them diminished amid the spread of household radios after the war. Shoshiro Ichihara, 77, who heads a neighborhood group, found out about the Nagoya radio tower in February last year when a man came to take photos and made inquiries with local residents. “I live close by, but never realized (what it was),” Ichihara said. Ichihara conducted a survey last autumn of 80 households in his group, asking them whether they knew about the radio tower and what they should do with it. 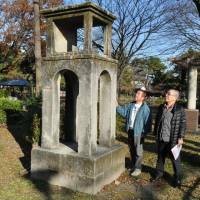 The survey found most respondents wanted the tower preserved, so the group presented the results to the Nagoya Municipal Government and asked to place an information sign nearby. “It was possible that this radio tower was used for military broadcasts, so it is necessary to keep it in order to pass on the history of the war to the next generation,” said Ichihara. Yoshii said it is unknown how many radio towers are still left in Japan, but they have been found at 30 locations so far. In Nagoya, radio towers can be found in two other parks but a city official said the government was unaware of their existence before the one in Shiga Park was found. In other areas of Japan, there is a growing movement to review their use, with Kyoto and Osaka utilizing devices in those cities for radio calisthenics, according to Yoshii, adding the towers can also be used for evacuation announcements during natural disasters. “Protecting radio towers in the region can contribute to the creation of communities as well as disaster prevention,” said Yoshii. This section, appearing Tuesdays, features topics and issues from the Chubu region covered by the Chunichi Shimbun. The original article was published Feb. 25.